Eastleigh have signed former Wycombe Wanderers midfielder Sam Wood on a two-year-deal. Wood was released by Wycombe in May after five seasons with the club. The 30-year-old previously played over 100 times for Brentford and also had spells in non-league with Cray Wanderers and Bromley. The versatile player can play on either side in a defensive or midfield role. Eastleigh Football Club are delighted to announce the signing of Sam Wood. Eastleigh have announced the signing of 32-year-old winger Mark Yeates. Yeates began his career with Premier League side Tottenham Hotspur before joining Colchester United, first on a season-long loan before making the switch permanently in 2007. Mark has gone on to play for Middlesbrough, Sheffield United, Watford, Bradford and most recently Notts County. He will link up with the rest of the Eastleigh squad on Thursday (29th June), as the Spitfires return for pre-season training. Yeates has been given squad number 10. Eastleigh sign former Premier League winger EASTLEIGH have signed former Premier League winger Mark Yeates. The 32 year-old has signed a two-year deal and brings with him some experience of playing in the top flight with Tottenham. Eastleigh manager Richard Hill has said that Chris Zebroski deserves a second chance and he is happy to give that opportunity to a forward that he says has "something to prove". Zebroski played for the Spitfires for a short spell in 2013 before moving to Newport County. The 30-year-old was jailed during his time in South Wales for robbery and assault. He is looking to put that behind him now having signed a 12-month contract with Eastleigh with the option of a further year. Hill said: “It’s alright people in glass houses throwing stones, but I like to give people second chances. “I like people that have got something to prove and Chris has admitted he has done wrong in the past. “He needs another chance and he’s going to get that opportunity here. “He turned down opportunities with other clubs to come and play for us. Chris is as excited as anything to come and play for Eastleigh. “He liked it when he was here before and he wants to play for this football club. Richard Hill has indicated that Ross Flitney's main responsibility on his return to Eastleigh will be that of goalkeeping coach. Flitney who won the Conference South with Eastleigh in 2013/14 comes with the added benefit of providing competition for the number one jersey. Hill said: “Ross will be registered as a player but don’t forget that Ben Strevens (coach) and Paul Reid (head of recruitment) are also registered players, but it’s not the case that they’re going to play that many games. “I’m not saying Ross won’t, but I’ve always said that he will be a good goalkeeper coach. “Forget his age, experience and everything else, I told him when he was here before that he should think about doing his badges and I said it again when he was with me at Whitehawk. “Until the last few weeks, Ross hadn’t been that interested, but I spoke to him again and told him this would be a nice opportunity for him. Eastleigh have announced the return of goalkeeper Ross Flitney and striker Chris Zebroski. 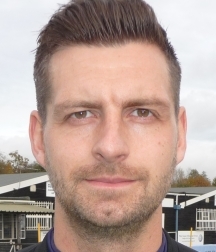 Flitney, who has played almost 200 times for the Spitfires, will compete for the number 1 shirt and also join Richard Hill's back room staff as goalkeeping coach. He was a prominent figure in the side that won promotion from the Conference South to the National League as Champions in 2014. Also returning is striker Chris Zebroski who joins on a 1-year-deal. Zebroski had a short time with Eastleigh in 2013. He last played for Newport County and brings with him Football League experience. Defenders Adam Dugdale and Chinua Cole have announced that they have both left Eastleigh by mutual consent.